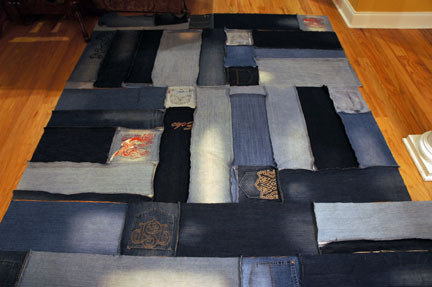 Well, I have gone as far as I can with my blue jean rug and I love it. I threw my initial plan out of the window and just started stitching pieces together. I became too caught up and intimidated by the process and had to simplify or be defeated. I stitched with wrong sides together so my seams appear on the topside of the rug. I have it divided in 5 pieces and I plan to wash it tonight so that the edges will fray. It would be too large to machine wash if it was completely stitched together at this point. As I was cutting up my crazy collection of jeans (10 pairs), I discovered a few pairs that had equally interesting fabric for the front pocket lining. I'm going to cut that fabric into appliques - probably my sons' initials. I'll document that for you when I get to that point this week. 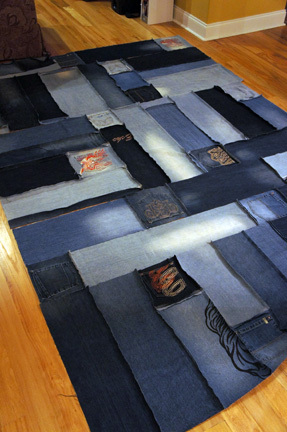 My initial plan was to make an 8' x 10' rug, but along the way, I decided to go with whatever dimensions I wound up with. I stopped when the jeans ran out. The rug is very large and it's going to make an impression in the room at the size it is now, which is somewhere in the 7' x 9' area. I've got a little trimming to do around the edges to clean it up. I received a message not long ago from someone asking me how I was going to finish it - what I would back it with, etc. All along, I was anticipating having to purchase some sort of duck cloth or canvas to finish the back of the rug - and to create the binding. I have yards and yards of the ugliest fabric (bad online purchase decision) that would actually be PERFECT for this rug. Everything about it is right - the weight, the print, everything. I even have a photo of it that I wanted to share with you... but it's on my computer... in storage. I'm not much help today, am I? So, now all I have to do is wait until we move to finish this project. I'll admit, I'm disappointed about having to wait, but we're unable to use the rug until then anyway. I may purchase some fusible fleece for an interior layer, but I haven't really investigated that option yet. 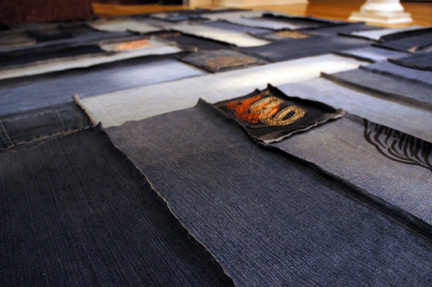 If you would like a step-by-step tutorial for making a really cool jean rug (it's actually a picnic blanket, but the same principles apply), I ran across this one over the weekend. Had I found it before, it may have saved me from myself. I'll be back in black next weekend. I have some more exciting projects planned to tackle this week that I think you'll find inspirational. As always, thanks for reading and returning. You mean a lot to me... yes, you do, and I know who you are. Google Analytics is my best friend.